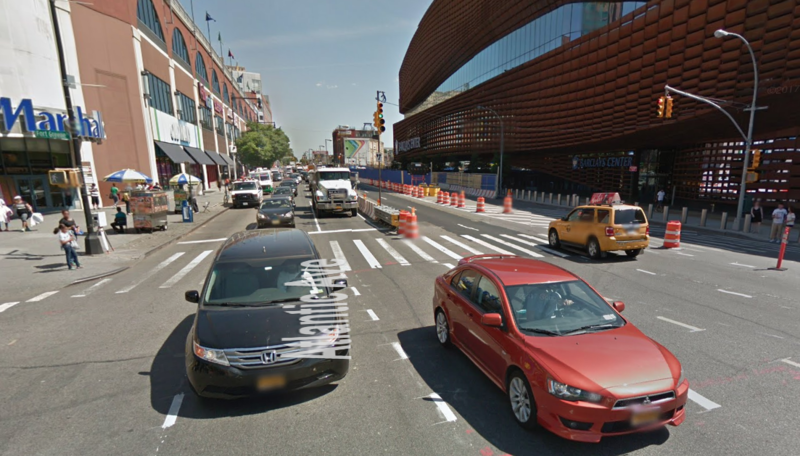 There’s a little more protection for pedestrians crossing the street around Atlantic Terminal and the Barclays Center. 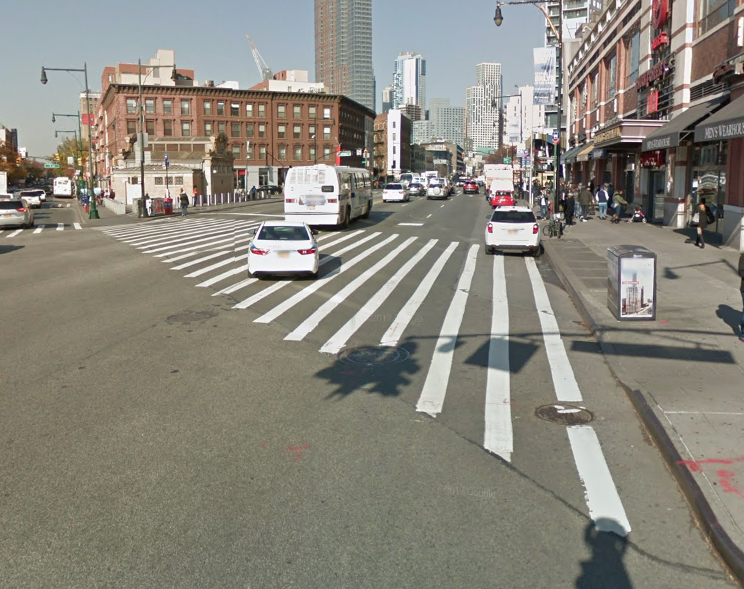 Atop the borough’s largest transit hub, the many-legged intersection of Flatbush, Atlantic, and Fourth avenues is the crossroads of Brooklyn, but it’s extremely hazardous, especially if you’re walking or biking. The streets are designed to keep traffic flowing to and from the free East River bridges, and they meet at irregular angles, forcing pedestrians to traverse long, angled crosswalks. There are no bike lanes on any of these major streets. 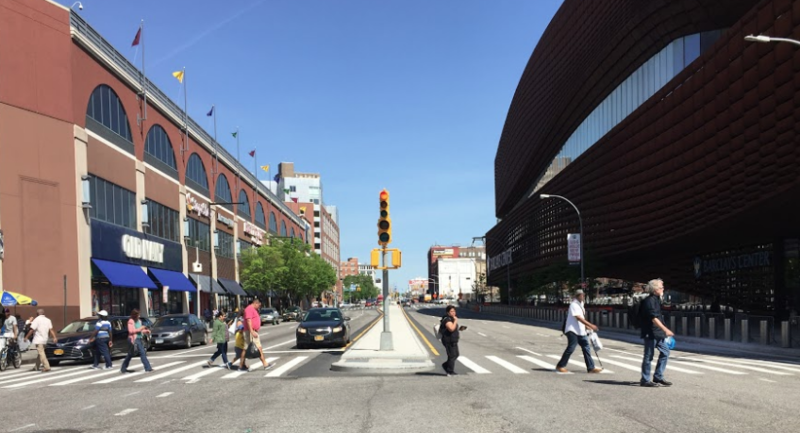 Now, at least, there are four new pedestrian islands at Atlantic and Flatbush. The concrete islands are certainly an improvement over what existed before — i.e. nothing. They break up the crossing for pedestrians and give drivers some physical objects to avoid. But without more substantial overhauls of Flatbush and Atlantic that reduce the number of car lanes, these fixes can only go so far [PDF]. 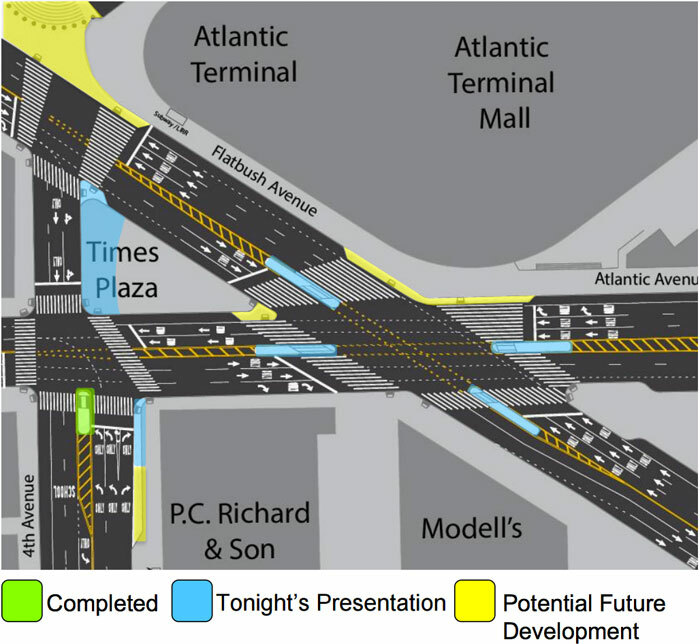 In 2016, DOT and Barclays Center developer Forest City Ratner presented plans for public space improvements at Times Plaza, which sits at the convergence of the three avenues. Local residents and elected officials pushed the city to make concrete pedestrian safety improvements to the area before inviting more people to hang out at the plaza. The one leg of the intersection that will be getting an extra multi-modal safety boost is Fourth Avenue. DOT’s upcoming redesign of Fourth Avenue will include a curbside protected bike lane on at least one side of the street south of Atlantic. I go though here twice a day to be a bit of an improvement. at least peds have some where (somewhere very small) to shelter from the rivers of traffic. now if only the traffic cops wouldn’t wave drivers into the intersection in cases when those cars end up blocking the opposite crosswalk. that is still a better than when the traffic cops aren’t there and drivers proceed even when doing so means blocking a couple of lanes of traffic (and the opposite crosswalk) after the light changes. Really liking the new islands (maybe for traffic calming more than anything else). But in my mind, the most significant improvement to the intersection was getting rid of the double right turn lanes from Atlantic late last year. Anyone know if the curb extension at the SE corners of 4th & Atlantic and 4th & Flatbush (in blue in the above slide) are still going in as part of the current project?